Home SPFPA News Victory in Indiana! Great News! Over 138 Inter-Con Officers in Indiana voted overwhelmingly to join our SPFPA family. 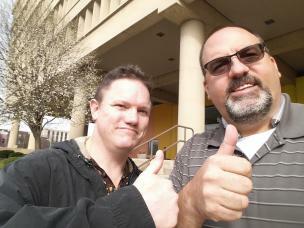 SPFPA Supporter Chris Flick joined SPFPA Director Tony Seefeld with a “BIG THUMBS UP.” Welcome aboard everyone!